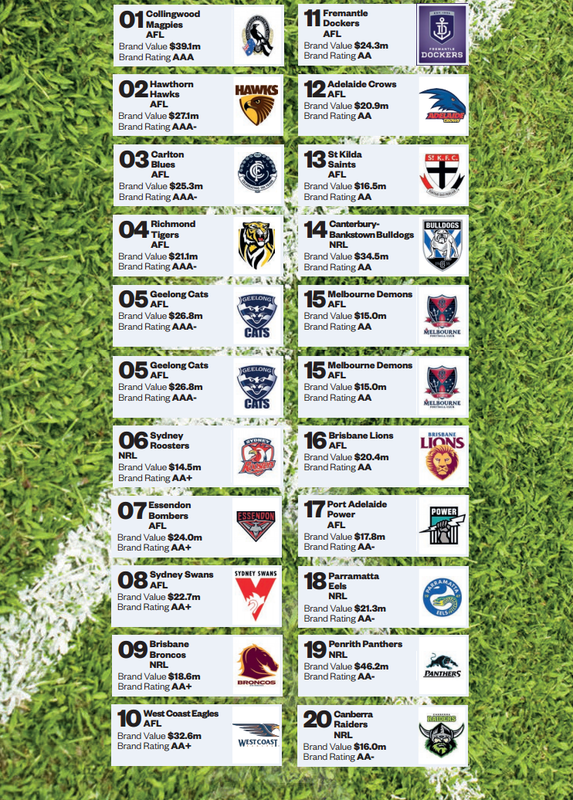 In December 2013, Business Review Weekly published a report on Brand Value [“AFL clubs “running away” from NRL in brand value race“]. The report found that while Penrith have the highest revenue turnover – and by a fair margin – it rated the brand at AA- below Collingwood (AAA), Hawthorn (AAA-), and West Coast (AA+). Fourteen of the top 20 clubs ranked were AFL clubs with the rest being NRL clubs. The combined value of the top 20 brands is $485 million, of which AFL clubs contribute $334 million. This is more than double the value of NRL teams in the Top 20 whose combined brand value totals $151 million. Haigh suggests that Brand Finance considers revenue from poker machines to have less importance to brand value calculations than revenue from other sources, such as team shirts or branded caps. But the sheer weight of money flowing through the Panthers Group pushes it to the top of the list. The Panthers were one of the lowest rated brands in the Top 20, only managing an AA-, joined at the bottom by the Raiders. This is predominantly a result of poor performance in the league and low attendance at games. The AFL teams come on average higher up the brand rating than the NRL teams. This is due to larger stadiums, membership bases, attendance and revenues on average for the AFL teams. The AFL’s commitment to investing in the growth of the sport has allowed all the franchises to flourish.